Home/Erika Carlson's Blog, Mental Skills, Mental Toughness, MTI Blog/Calling All Perfectionists! If this sounds like you, chances are you consider yourself a “perfectionist.” You strive to connect every pass, make every play, execute every drill perfectly. You push your self to win every sprint, and anything less than perfect feels totally frustrating. That’s a good thing, right? Wrong. 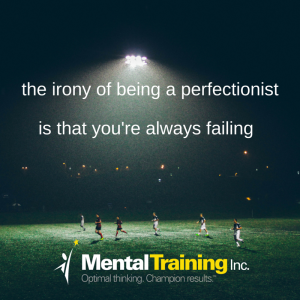 The irony of being a perfectionist is that you’re failing all the time. When is the last time you succeeded at having an absolutely perfect practice, game or drill? There are perfect moments in sport (enjoy every second! ), but there are not totally perfect training sessions, games or practices. There are always ways to get better. Striving to be perfect may help you push to work harder and get it right, but the failure rate of perfectionism (100%) is not a great confidence builder. What’s the solution? Make a small shift away from perfectionism to striving for excellence. What’s the difference? Both mindsets require an incredibly tough work ethic, pushing hard to improve, high expectations, being detailed and highly competitive…all excellent characteristics for high achievement. The difference lies in how you manage challenges. Perfectionism has zero margin for error, which is why perfectionists are easily frustrated and often upset about their performance. Excellence, however, indicates that mistakes, set backs and challenges are inevitable and are actually extremely valuable for developing as an athlete. The excellence mindset helps you work through challenges with less frustration, so you learn faster and build more stable confidence. Confidence not just as a competitor, but also confidence in your ability to overcome challenges…which is one of the most advantageous mental toughness skills.